In this week's final coupon sale, the US Treasury sold $30BN in 7Y paper in what was a surprisingly strong auction considering the doom and gloom predicted by many pundits who were dreading this week's $99bn supply in cash coupons, stopping at a high yield of 2.93%, below last month's 2.952% and a testament to the ongoing flattening between the short-end and the belly, and also 0.5bps through the When Issued 2.935%. And while the yield dipped over the past month, the internals were surprisingly similar to last month's auction, almost bizarrely so: the Bid to Cover was 2.625 vs 2.56 last month, above the 6 month average of 2.51 and the highest since January. Meanwhile, foreign buyers, i.e. Indirects, took down 65.5% vs 65.8% last month, and 63.5% in the last 6 months; Directs took down 12.9% vs 12.7% last month and 12.9% for the recent average, leaving 21.6% for Dealers, the exact same award as Dealers took down last month. 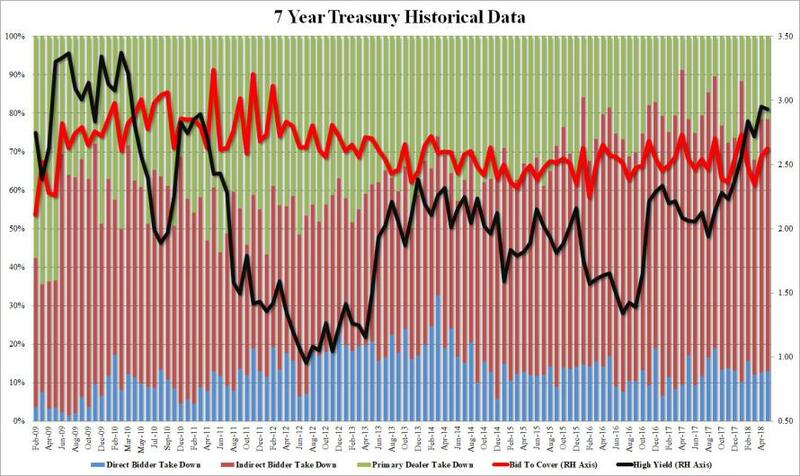 And with that this week's mega supply of just under $100 billion was successfully absorbed by the market, which can now look forward to next week's sale of 10Y and 30Y, where once again the big question will be whether or not the cash coupon on the 10s will be 3% or once again 2.875%.